Dan’s taking ribs to Mexico for a whole new take on the taco. Seasoned rib meat is pan-fried (but kept rare!) and cut against the grain with succulent results. 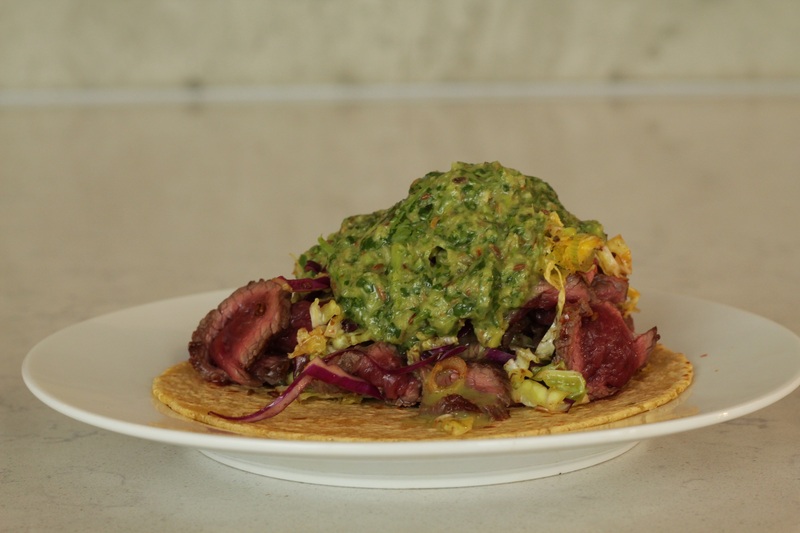 A rustic, hand-blended chimichurri sauce and chipotle, jalapeno cabbage slaw are the perfect taco companions for the rare rib meat. Serve in warmed corn tortillas and enjoy this inspired twist on a Mexican standard. • The first thing you’ll need to do is to remove the meat from the ribs. Start by cutting against the bones. Remove the silver skin from the meat. The ribs and the leaf over meat is perfect for a stock or sauce. • Get a pan nice and hot. While the pan heats up season both sides of the bison ribs with salt, dried chiles and cumin seeds. Tap your seasoning into the meat. • Pour in Canola oil and place the ribs in too. Remember to place the meat away from you to avoid any splash back. Give it a little over a minute per side, depending on the thickness and how well done you want the ribs to be. • Check to see that there is a nice colour of brown and the outside has a bit of a crust on it. If so, remove from the heat and allow to rest to one side. • After it has had a chance to rest, slice the meat into thin slices, against the grain. • While the pan continues to heat, you can start your chimichurri by placing cumin seeds in a smaller dry pan and allowing the cumin to start toasting on high heat for 1 ½ minutes. While the cumin toasts, take a bowl or pale and place the cilantro, majority of the green stalks of the green onions, 1 jalapeño(minus the stalk) and Canola oil. About now the the cumin seeds will start to pop, hiss and crackle. Use a pestle and mortar to grind them up and add them to the bowl or pale with the other chimichurri ingredients. Add in the juice of one lemon, ginger, garlic, vinegar and salt. Take a hand blender and blend all the ingredients together, until well mixed. Add salt to taste. • Take your two types of cabbage and slice into long pieces and place in a bowl, along with the juice from chipotle in adobo, dried oregano, Canola oil, sliced jalapeño and the diced green onions. With clean hands mix everything together. • In a small pan, heat up your tortilla shells on a low heat. Flip after 30-45 seconds. • Take a warm tortilla and pile on some coleslaw, a healthy portion of bison ribs, a bit more coleslaw and topped with a dollop or two of chimichurri.